Posted on 3, August 2016 by EuropaWire PR Editors | This entry was posted in Energy, Gas & Oil, Investment, Management, Norway and tagged BM-S-8 offshore licence in Brazil, Petrobras, Santos basin, Statoil ASA. Bookmark the permalink. Statoil ASA (OSE:STL, NYSE:STO) and Petróleo Brasileiro S.A. – Petrobras(“Petrobras”) (BVMF: PETR4, NYSE:PBR) have agreed that Statoil will acquirePetrobras’ 66% operated interest of the BM-S-8 offshore licence in Brazil’s highly prolific Santos basin. The acquisition includes a substantial part of the Carcará oil discovery, one of the largest discoveries in the world in recent years. OSLO, 03-Aug-2016 — /EuropaWire/ — Carcará was discovered in 2012, on the geological trend of the nearby Lula field and Libra area. It is a world-class discovery of high-quality oil of around 30° API and with associated gas in a thick reservoir with excellent properties. It straddles both BM-S-8 and open acreage to the north, which is expected to be part of a licence round in 2017. Statoil is well positioned for operatorship of a unitised Carcará field following this transaction and the licence round will provide an opportunity to scale up the position in the field. Statoil estimates the recoverable volumes within the BM-S-8 licence to be in the range of 700 to 1,300 million boe. In addition to the Carcará discovery, BM-S-8 holds exploration upside that may significantly increase its resource base. The licence is in its final exploration phase with one remaining exploration commitment well to be drilled by 2018. “Through this acquisition we are accessing a world class asset, and we strengthen our position in Brazil, one of Statoil’s core areas due to its large resource base and excellent fit with our technology and capabilities. The Carcará field will significantly enhance our international production volumes in the 2020s and beyond. We are developing a strong Brazilian business with a broad portfolio, material production, high impact exploration opportunities and excellent potential for long term value creation and cash flow,” says Eldar Sætre, president and chief executive officer of Statoil. The total consideration for the acquisition is USD 2.5 billion. Half of it will be paid upon closing of the transaction, with the remainder being paid when certain milestones have been met. These are partly related to the licence award, but mainly to the future unitisation of Carcará. The effective date for the transaction is 1 July 2016. Closing is subject to customary conditions, including partners’ and government approval. Statoil and Petrobras are also in discussions regarding a long-term strategic cooperation. The focus will be in the Campos and Espírito Santo basins, as well as new cooperation within gas and technology projects in the Santos basin. gas Approximately 1bn boe in recoverable reserves. Statoil has been in Brazil since 2001. This year marks five years of production at the Statoil-operated Peregrino field. 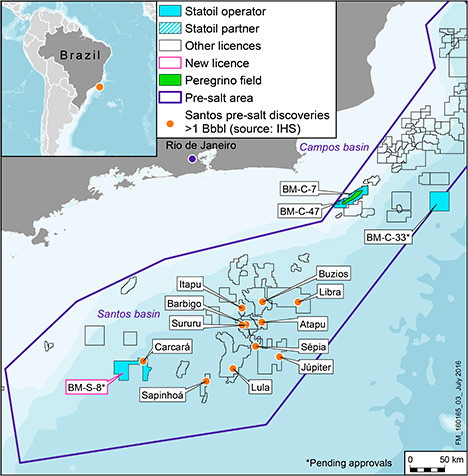 Peregrino Phase II is due to commence production in 2020, and in the third quarter of 2016 Statoil expects to assume operatorship of licence BM-C-33 in the Campos basin which includes the Pão de Açúcar discovery. Statoil also has interests in eight licences in the Espirito Santo basin, working in partnership with Petrobras, and expects to spud its first exploration wells during 2017. It has developed a strong local organisation with nearly 90% of its workforce from Brazil and its operations have so far created 1,000 direct jobs. The addition of BM-S-8 to Statoil’s Brazil portfolio will help deliver profitable growth through greater operational flexibility and efficiencies.